This recipe is a stand out crowd pleaser. One of the reasons I love cooking is seeing the joy on someone’s face when they eat and enjoy something I have made. Once you put this dip on the table it will be instantly surrounded by a crowd of people who can’t stop dipping and dunking, it’s so good and it will be gone in about 10 minutes flat. A friend’s mum made it at a party years ago and I only just asked for the recipe, wish I had asked sooner! I made a few tweaks and this the result. Seriously good comfort food. Preheat the oven to 180C. Cut the top off the cob loaf, and hollow out the inside with your hands. Spray the inside with some spray oil and bake for about 10 minutes. Meanwhile, heat the spinach (add in the spinach water as well), cream cheese, sour cream and French onion soup mix in a saucepan until combined. Cook bacon in a fry pan until crispy and then set aside to cool. Whizz in a blender until you have fine crumbs. You can mix it into the spinach if you want to, but I like to leave it on the side. 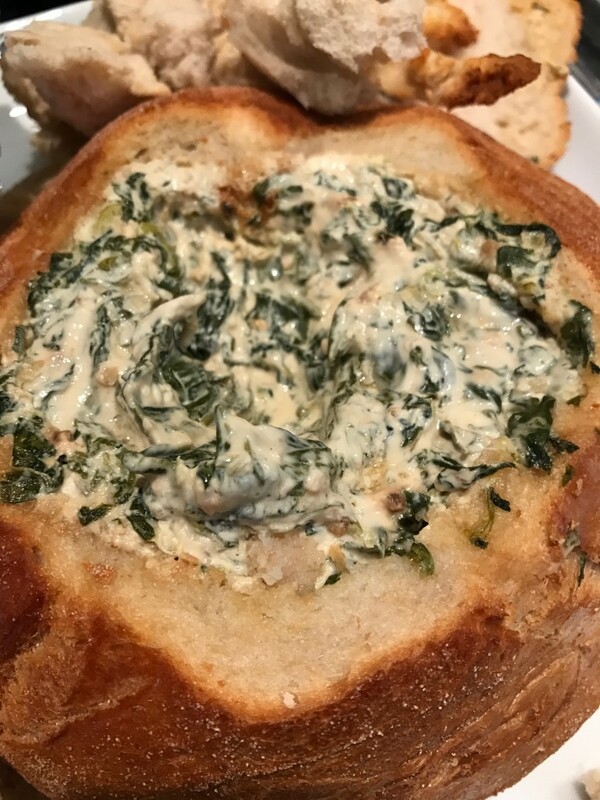 Pour the spinach mixture into the cob loaf and put the lid back on. Give the bread chunks (which you took from the centre of the loaf) a spray of olive oil and bake the bread and cob loaf for about 15-20 minutes until the dip is warmed through. The loaf can be transported at the beginning of this stage and reheated at your friend’s house instead – easy! Serve the loaf with the bread chunks on the side, along with the bacon crumbs. Dip the bread chunk into the spinach, followed up by the bacon crumb. You’re welcome.